People all over the world can hum his tunes, yet relatively few have ever heard his name. He was championed for creating a new sound in jazz, but never made it into jazz history books. His music was harmonically daring, but found its greatest audience through popular cartoons. A swing-era celebrity, he also stood at the vanguard of electronic music. These are among the dichotomies in the musical legacy of composer, bandleader, pianist, engineer and inventor Raymond Scott. Born in Brooklyn on Sept. 10, 1908, Scott (birth name: Harry Warnow) led a multidimensional career that reached both the heights of fame and the deepest corners of obscurity. He died in 1994, amidst a cult-hero resurgence of his music. When I attended Rutgers University’s Jazz History and Research program in the mid-aughts, I wrote my master’s thesis about Scott, partly in order to reassess his place in jazz history. That stature has evolved since, and largely for the better. Last month, in honor of what would have been Scott’s 110th birthday, an array of artists, historians and other admirers gathered in Burbank, Calif. for ScottWorks: The Raymond Scott Festival — a full day of music and conversation in his honor. 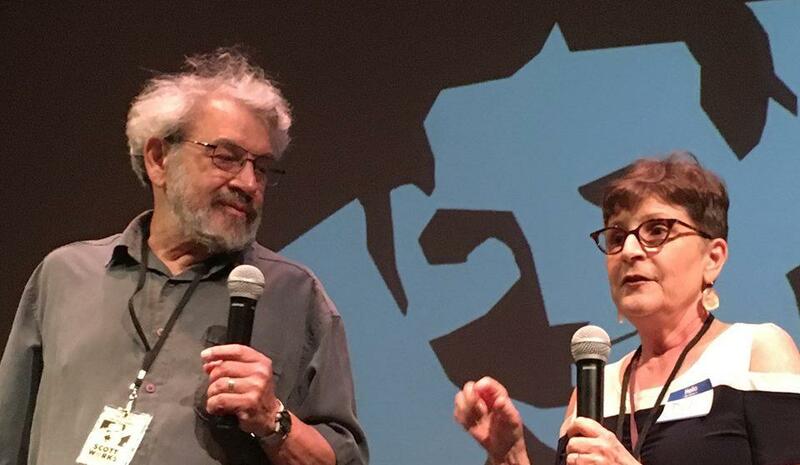 This event, possibly the first of many, was the brainchild of two of Scott’s children, Deborah Studebaker and Stan Warnow, whose 2011 film, Deconstructing Dad, documented his career. While a massive logistical undertaking, ScottWorks was an undeniable success. “This is such a love fest,” marveled Studebaker onstage, surveying a packed crowd. Her words were further borne out by many standing ovations over the course of the day, from an audience utterly engaged in every facet of Scott’s career. In this special guest edition of Deep Dive with Lewis Porter, we’ll reflect on that career, and take a close look at some of the musical details that make Scott such a fascinating figure. The Raymond Scott Quintette, with Scott at the piano, recording its first commercial sides at 1776 Broadway, Feb. 20, 1937. He rocketed to fame just over 80 years ago, with a series of original compositions performed by the Raymond Scott Quintette (in actuality, a six-piece band). These frenetic, playful and intricate works — the first of which were recorded in New York City on Feb. 20, 1937 — were a world apart from the popular big band style of the day. Excerpt of "War Dance For Wooden Indians," by the Raymond Scott Quintette. Recorded Dec. 20, 1937. Propelled by radio features, the Raymond Scott Quintette’s “novelty jazz” (as it was often termed at the time) was a smash hit, earning accolades from jazz critics and fans alike. Then he moved on. 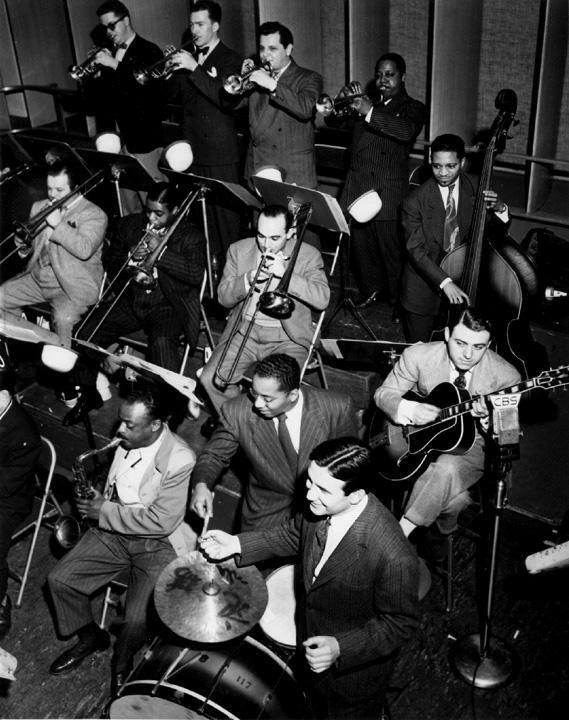 In 1939, Scott formed a big band and began touring with more traditional arrangements of standards. His own compositions, though still vibrant and musically rich, became less overtly comic and eager to impress. Few of them garnered much attention from jazz critics or fans. The CBS Radio orchestra, in a photo published in the May 1944 issue of Metronome. 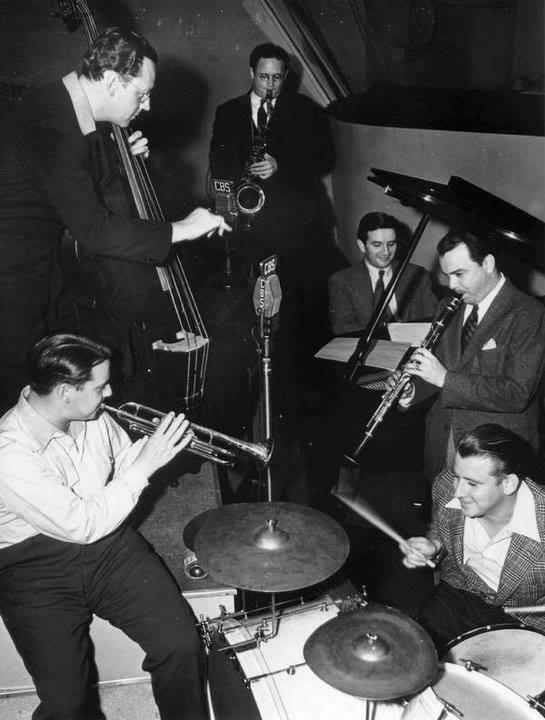 It was the first racially mixed network studio orchestra; pictured here with Raymond Scott are Ben Webster, Cozy Cole, Charlie Shavers and Tony Mottola. Scott expanded his career in other arenas. He wrote a Broadway musical and a concert piece; led the first racially integrated radio network orchestra; and eventually led the band on television’s Your Hit Parade. Through the ensuing decades, Scott continued to write and record fascinating, innovative music of his own for various ensembles, including some for his own private record labels. None reached the commercial success of the Quintette. What’s more, the world of postwar jazz history and criticism wrote him off almost completely. Most writers treated Scott as a gimmicky interloper unworthy of acceptance into the jazz canon — on the rare occasion that they acknowledged his existence at all. Certainly, Scott’s Quintette recordings deviate from textbook definitions of jazz. Although their language is clearly born from jazz, they feature little to no improvisation. Their harmonic basis, rather than an exploration of elegantly progressing chords borrowed from the Great American Songbook, lay in the textural and narrative potential provided by mode and chord combinations. Scott’s goal was “descriptive music” — inspiring listeners to envision wild scenes, often in exotic locales. “Reckless Night on Board an Ocean Liner” transports the listener to the high seas, for example, while “Bumpy Weather Over Newark” finds the swing in airplane turbulence. Excerpt of Raymond Scott's "Bumpy Weather Over Newark." Excerpt of Raymond Scott's "Oil Gusher." Sound painting had been explored in jazz composition before — notably by one of Scott’s musical models, Duke Ellington — but this application was different, with the express purpose of conjuring humor. Small wonder that Scott’s music proved such a natural fit for Bugs Bunny. After the publishing rights for Scott’s Quintette compositions were sold to Warner Brothers in 1943, studio composer Carl Stalling began liberally quoting and adapting those melodies in the scores for Looney Tunes animated films. Scott’s name never appeared in the credits of these cartoons, but because of them his melodies are some of the most well-known on the planet. Excerpt 1 of "Powerhouse," by the Raymond Scott Quintette. Recorded Feb. 20, 1937. Let’s take a closer look at the A melody. It’s a two-part phrase constructed out of a very simple building block: a half-step. This is the smallest interval in Western notation, the difference between two adjacent keys on a piano. Scott repeats that interval to make a four-note unit, and then transposes and repeats it at successively higher pitch levels. Played in unison by trumpet, tenor and clarinet at a breakneck pace, and with a wide dynamic sweep, this theme has a chromatic tension that evokes the mechanical whirr of a power plant. Scott has taken the smallest of musical elements, a single interval, and built a melody out of it through repetition and transposition. Excerpt 2 of "Powerhouse," by the Raymond Scott Quintette. Recorded Feb. 20, 1937. The second part of the phrase starts the same way — but instead of descending with the same pattern, Scott surprises us by arranging most of the same pitches in a heavily accented, syncopated figure. This is another Scott trademark: say something, then say it again, but interrupt the end with a rhythmic surprise. Excerpt 3 of "Powerhouse," by the Raymond Scott Quintette. Recorded Feb. 20, 1937. Excerpt 4 of "Powerhouse," by the Raymond Scott Quintette. Recorded Feb. 20, 1937. This sense of rhythmic surprise and harmonic instability keeps the listener eager for the story to move forward, with the promise of something new and unexpected just around the corner. Variation on a theme is central to Scott’s style of programmatic storytelling. By taking a theme, presenting it in a new context, using parts of it to make a new theme, then having the original return with a different style of performance, he creates a sense of narrative. There are few literal repeats in his work. Whenever a theme returns, it’s somehow different for the journey. The themes that Scott takes on that musically transformative journey are not just melodies — they always have some form of extra-musical character. Sometimes it’s evocative of a real-world sound. Sometimes it is an existing melody from light classical literature that brings along its own cultural cachet (or cliché). Excerpt 1 from Raymond Scott's "In an Eighteenth Century Drawing Room." Excerpt 2 from Raymond Scott's "In an Eighteenth Century Drawing Room." Excerpt 3 from Raymond Scott's "In an Eighteenth Century Drawing Room." The motivic relationship between this second theme and the first offers a sense of narrative cohesion. The piece continues with further variations, each adding more jazz elements to both the melodic statements and the accompaniment. Excerpt 4 from Raymond Scott's "In an Eighteenth Century Drawing Room." It’s not just the melodies in Scott’s music that are descriptive. The variations in style, and the harmonic contexts in which he places them, also often carry extra-musical meanings. These are known reference points, much as in a film score, with the audience keenly aware of the game. It’s that self-conscious, knowing quality that gives his work its postmodern humor. Take “New Year’s Eve in a Haunted House,” in which chimes and noise makers ring in the New Year midway through the record. Excerpt of Raymond Scott's "New Year’s Eve in a Haunted House." While for today’s listeners it may be difficult to divorce Scott’s music from its association with cartoons, it’s important to note that the aura of mischievous humor in his work predates Carl Stalling’s usage. This is not music that became funny via post hoc appropriation; its inherent humor made it ripe for comedic settings. At the same time, the strength of Scott’s melodic content and the power of its extra-musical allusion are precisely what allows him to venture through some harmonically strange spaces. While Scott was earning a living running down the popular songs of the day on radio and television, he was privately pursuing his passion of audio engineering. 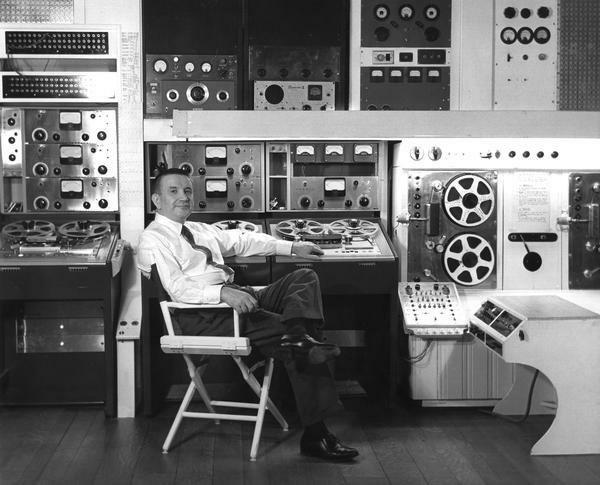 Raymond Scott in his 1950s recording studio, New York City. He invented a number of wildly innovative electronic instruments including the Clavivox, a keyboard-controlled adaptation of a Theremin, and the Circle Machine, now recognized as the world’s first electronic musical sequencer. With these new tools, Scott was able to deploy hitherto unheard musical timbres in advertising soundtracks. His ultimate creation, though, was the Electronium — an “instantaneous composition and performance machine” that allowed a composer to generate and record unending variations of accompaniments, rhythmic patterns, timbres, and more with the push of a button. The Electronium caught the attention of Motown head Berry Gordy, who purchased one in 1971 and employed Scott to update and perfect it. Here is an example of the Electronium in action, from 1968 or 1969, from a demonstration recording titled “When Will It End? Excerpt of "When Will It End?" by Raymond Scott, on the Electronium, late 1960s. In designing the Electronium, a tool to “take the work out of composing,” Scott offers us a unique opportunity to peer inside the workings of his compositional mind. The machine would come preprogrammed with a set of simple musical patterns that could be repeated, altered, and combined in a myriad of ways. While he often highlighted his musicians’ stellar instrumental abilities, Scott was not known as a patient or understanding bandleader. It’s no surprise that he developed machines to do the work of translating his compositional demands for rhythmic and stylistic variations. The Electronium was simply an automated approach to the writing style he had deployed throughout his career. To demonstrate, here is an excerpt of a 1970 recording of the Electronium accompanying Scott on keyboard in a re-setting of the same Mozart melody he had adapted in “In an Eighteenth Century Drawing Room” (this track was titled “In a 21st Century Drawing Room” by the reissue producers). Excerpt of "In a 21st Cenutry Drawing Room," by Raymond Scott. Recorded in 1970. Through this lens, the seemingly disparate impressions of Scott as a zany quasi-jazz humorist and an innovative electronic experimentalist are not difficult to reconcile. The terms of Scott’s relationship with Motown necessitated that his innovative creation remain secret. Further, Scott had long been hesitant to publish academically or commercially market his electronic music breakthroughs for fear of losing his unique stance in the advertising world. Outside of a handful of collaborators like Bob Moog, few knew of his pioneering work in the field. Once again, history forgot about Raymond Scott. In 1987, he suffered a series of heart attacks and strokes that left him debilitated and unable to work. The remnants of his recorded legacy and technical creations sat decaying in a shed until a record collector named Byron Werner sent a cassette of Scott’s music to DJ Irwin Chusid. Chusid became the administrator of Scott’s musical legacy and, along with others including Jeff Winner, championed a 1990s revival of Scott’s Quintette music that saw reissues, multiple tribute ensembles, sampling, and a whole lot of press. (In ’96, clarinetist Don Byron released Bug Music: Music Of The Raymond Scott Quintette, John Kirby & His Orchestra, And The Duke Ellington Orchestra.) Scott’s electronic work was also finally issued, with his place in that field’s canon acknowledged. One heartening thing about ScottWorks was the kaleidoscopic view it offered of Scott and his music. This was fully evident in the daytime panels — ranging from “Raymond’s Merry Melodies” to “Raymond Scott and Sun Ra” — but it came together most colorfully in music. Stan Warnow and Deborah Studebaker celebrating their father's achievements at ScottWorks, Sept. 8, 2018. 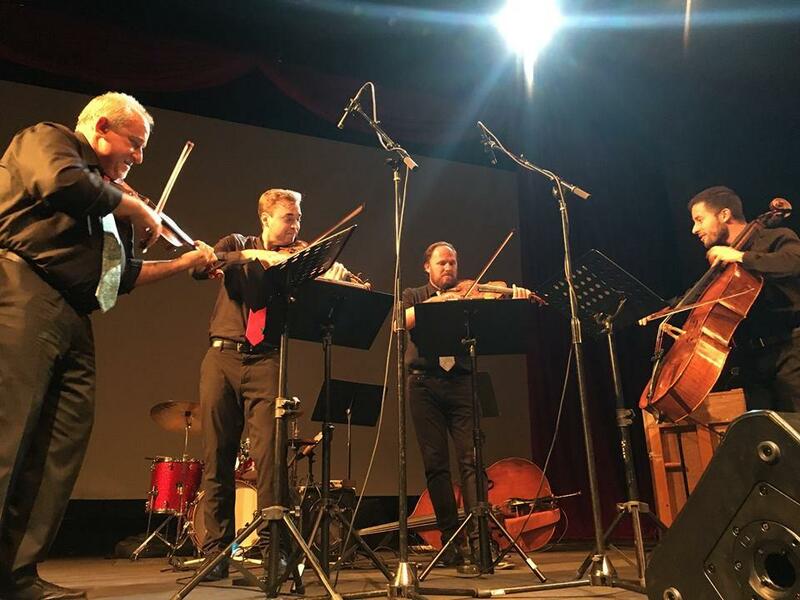 Jeremy Cohen with Quartet San Francisco at ScottWorks, Sept. 8, 2018. And Michael Whelan transported several tunes into the age of viral theatrics on electric guitar, electric bass and keyboards — all at the same time. Here is Whelan’s solo performance of “Square Dance for Eight Egyptian Mummies,” with a fond introduction by Chusid. The whole of Scott’s world of musical playfulness and experimentation was on vibrant display. To put a finer point on it, opportunities in 2018 to be among a few hundred people all grinning from ear to ear are rare. I felt lucky to have caught this one. Excerpt of Raymond Scott's "Girl at the Typewriter." By always bringing the audience in on the joke, Scott’s good natured humor leaves everyone happy. The cultural legacy of Scott certainly owes much to animation, but it would be a mistake to paint that as a happy historical accident. The music’s place in cartoons was thoroughly earned. I’ll let Scott make the final argument himself. First, hear his iconic composition “The Toy Trumpet,” taking the story of a child’s musical Christmas gift through stylistic permutations from cute to New Orleans. It was the A side of a 78-r.p.m. Master disc released in 1937, with “Powerhouse” on the B side. And here is a late-1960s recording of the same tune, with Scott now on an electronic keyboard accompanied by the Electronium. The Electronium’s “rhythm section” evolves, progressing the narrative by variation. This was included on a 2000 compilation released on the Netherlands based Basta Music, comprising experimental as well as commercial works from the postwar era. Whether writing for a jazz combo or designing a machine to write for itself, Raymond Scott was, at his core, a musical storyteller. As evidenced by ScottWorks, it’s a story that remains resonant with audiences and musicians today. The seeming conflicts that hindered and compartmentalized Scott’s career during his lifetime — the questions of his jazz legitimacy, the tension between his roles as innovator and commercial hit-maker — seem far less consequential in our current musical environment. At a time when genre straddling is viewed as healthy and essential, when technology regularly sculpts sound along with performers, and when even the most avant-garde sonic explorers market their work via social media, we just might have room to have fun with Raymond Scott’s music. Yes, all of it. This is the first guest installment of Deep Dive with Lewis Porter, our popular jazz historical series. Corey Goldberg is the Operations Assistant at WBGO, where he records many of our in-studio performances and produces segments for broadcast. He is also a graduate of Rutgers University’s Jazz History and Research M.A. program, where Dr. Porter was his thesis adviser. Duke Ellington was among the preeminent American composers of the 20th century, and the most exhaustively studied of all jazz artists. There are more books and articles about him than any other jazz musician, and collectors have pored over his vast discography — not just a prolific half-century studio output but also hundreds of hours of radio broadcasts, audience tapes, and film and television appearances. You’ve surely seen reports about the newly discovered studio session by the John Coltrane Quartet, recorded on March 6, 1963.